Fill large pan with water just a couple inches from the top. Add ham to water. Cook at medium temperature for 4 hours. Take ham out of broth. Let cool and then cut up. Meanwhile, add split peas to broth and cook on high until this comes to a boil, then turn heat down on low temperature and add your garlic and onion powder. 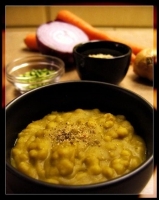 Let this cook for 2 to 3 hours until split peas look like puree. Add ham (thinly sliced) and serve. I take half the broth out before I add the split peas and I save for bean soup. 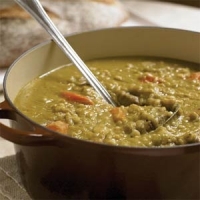 Recipe categories: < 4 hours, Soups & stews, 3 steps or less.